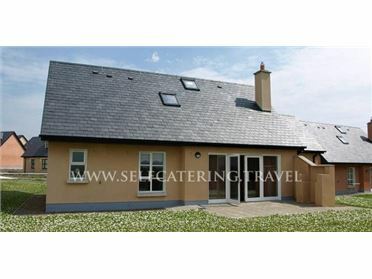 21 Brittas Bay Park is a detached cottage situated on the Brittas Bay Holiday Village, 8 miles from the town of Arklow. This cottage sleeps eight people in four bedrooms, consisting of a ground floor double with en-suite shower, a ground floor twin and two single rooms, one of which is on the ground floor. The cottage also has a ground floor bathroom, an open plan living area with kitchen, dining area and sitting area with solid-fuel stove, and a games room with pool table. Outside there is off road parking for two cars on a first come, first served basis and a lawned garden and decked area with furniture. With on-site facilities, including tennis courts and a football pitch, as well as a Blue Flag sandy beach a few minutes' walk away, 21 Brittas Bay Park is an ideal base for families. The holiday village of Brittas Bay is one of Ireland's premier tourist destinations. The village offers a tennis court, football pitch, basketball court and a children's clubhouse, plus within walking distance is a Blue Flag sandy beach. Electric central heating with solid fuel stove. Electric oven and hob, microwave, fridge, washing machine, dishwasher, TV with Free-to-air channels, DVD, CD/radio, selection of books and games. Fuel, power and starter pack for stove inc. in rent. Bed linen and towels inc. in rent. Travel cot and highchair. Ample roadside parking on first come, first served basis. Lawned garden and decked area with furniture. Free shared use of on-site tennis courts and football pitch. Sorry, no pets and no smoking. Shop and pub 1.5 miles. Beach 5 mins walk. Note: Tennis court and football pitch are open all year round. Children's clubhouse is open in July and August only..